Products Used: Merlyn enclosure and tray, Mereway units, sanitaryware and worktop, Porcelanosa tiles, Radox towel rail and Vado brassware. The Brief: The client wanted to add a small shower enclosure to the bathroom, with lack of space we decided to use the cupboard in the spare room backing onto the bathroom for the shower enclosure. 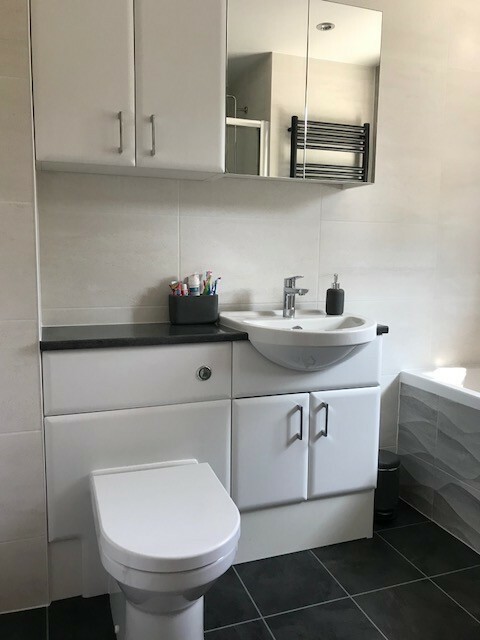 The client also preferred the room to be fully tiled leaning more towards the greyer tones and a contemporary look with a good amount of storage in the room. ​ Following a site survey and after a few small tweaks the client was very happy with the design. ​One small thing was changed to the design before installation. The client wanted a subtle feature tile in the bathroom, we decided to add it to the bath panel and on the back wall of the shower. The range of tile chosen from Porcelanosa did offer a matching tile with a slight wave design, this tied in well with the plain tile on the back wall behind the bath and worked well with the white tiles and darker flooring. We were able to fit in a good size shower, all the storage the client wanted, and the overall look of the bathroom works well, and the client was extremely happy.